Former South African president Thabo Mbeki panel has presented the findings of his panel to the African Union summit, where they were adopted directly into the declaration. Now, we’re biased for all sorts of reasons (more on that below), but this is an historic moment – and probably the most important report yet produced on this issue. In 2011 the UN Economic Commission for Africa was directed to establish a High Level Panel on Illicit Financial Flows out of Africa. 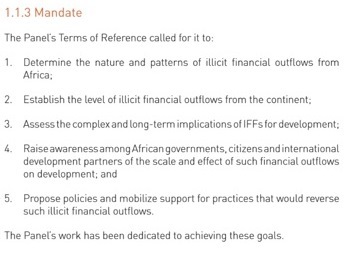 The panel’s mandate (see box) contains five elements: the first three relating to improved knowledge of illicit financial flows (IFF), the last two to bringing about political change to curtail them. In both areas, it’s reasonable to conclude that the panel has exceeded expectations. Although only time will tell just how much change has been catalysed, the initial evaluation is largely positive. 3. On the impact of IFF: The analysis is careful to look beyond simple dollar scale, or revenue impacts, and focuses rightly on the likely longer-term governance and state-building implications; and highlights the regressive distributional implications. We found that several African countries desired to become financial services centres, and, though we understand the reasoning, we feel strongly that African countries should not in the process become financial secrecy jurisdictions sucking resources from the rest of the continent. If a slower pace of progress has been the price paid for the strong support that saw the report immediately adopted by the AU heads of state, it was a useful trade-off. 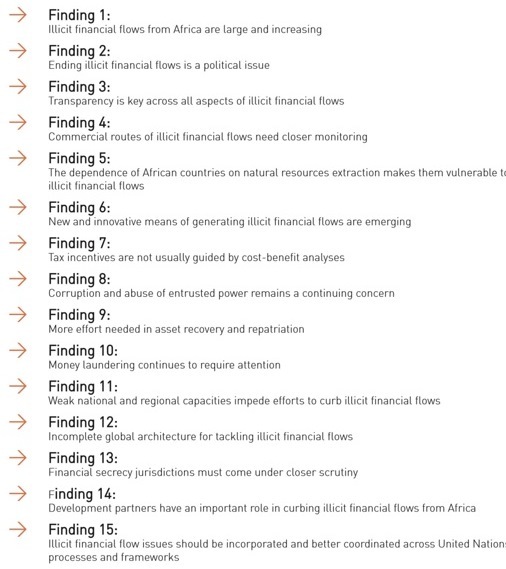 The 15 findings (below) in chapter 4 and the specific recommendations in chapter 5 which follow them include a welcome focus on African steps – welcome because the problem of IFF cannot be solved by international action alone (e.g. important issues such as the transparency and evaluation of tax incentives provided for multinationals are overlooked in international discussions), and because of the legitimacy that this ensures for the demands that are then made for international action. Overall, the recommendations provide a comprehensive basis for progress, closely derived from the analysis. The final section of recommendations is labelled “E. Further responsibilities of Africa’s partners”, and includes a powerful combination of more and less familiar ideas. Among the more obvious are for the publication – not just the collection – of both the country-by-country reporting of multinational companies, and the beneficial ownership of companies, trusts and other legal entities. The Panel recommends that the Bank for International Settlements publish the data it holds on international banking assets by country of origin and destination in a matrix format, along the lines of the data published by the IMF for bilateral trade; foreign direct investment and portfolio investment, so that it can inform the analysis of IFFs from Africa. It is increasingly anachronistic for a major international regulatory body to collect, but then to obscure, such important bilateral information. We look forward to the response of the BIS. The Mbeki panel has delivered a broad report, adding substantial value in its analysis of African IFF and setting out a powerful policy agenda. 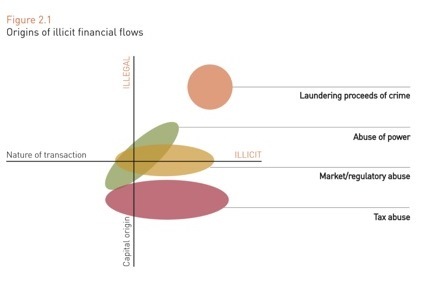 Notwithstanding contributions from international civil society and researchers including our own, the process and the outcome represent the first, comprehensive African policymakers’ response to illicit financial flows. While the last two years have seen major progress in G8 and G20 meetings, this African Union position provides a loud voice to a region that has been largely excluded from those processes. Unsurprisingly, while the issues overlap, the priorities are not identical. We look forward to concerted diplomatic pressure for further and more inclusive international policy progress in areas such as public beneficial ownership registers and fully multilateral automatic exchange of tax information.